For the first three quarters of 2014, more than one third (36 percent) of the new electricity capacity built out in the U.S. came from solar systems, according to a new report from the Solar Energy Industries Association. During the first three quarters of 2013, a bit less than a third (29 percent) of new electricity came from solar, and only 9.6 percent of new electricity came from solar in 2012 in the U.S. It shouldn’t come as a surprise that solar continues to break records. The industry is starting with a pretty small slice of the electricity pie — still less than one percent of total U.S. electricity — and has started booming in recent years. The price of solar panels is at its cheapest time in history, and new types of financing have emerged to help boost solar panel installations on the rooftops of homes and businesses as well as help fund those large ground-mounted solar systems being built in the deserts, with power sold to utilities. 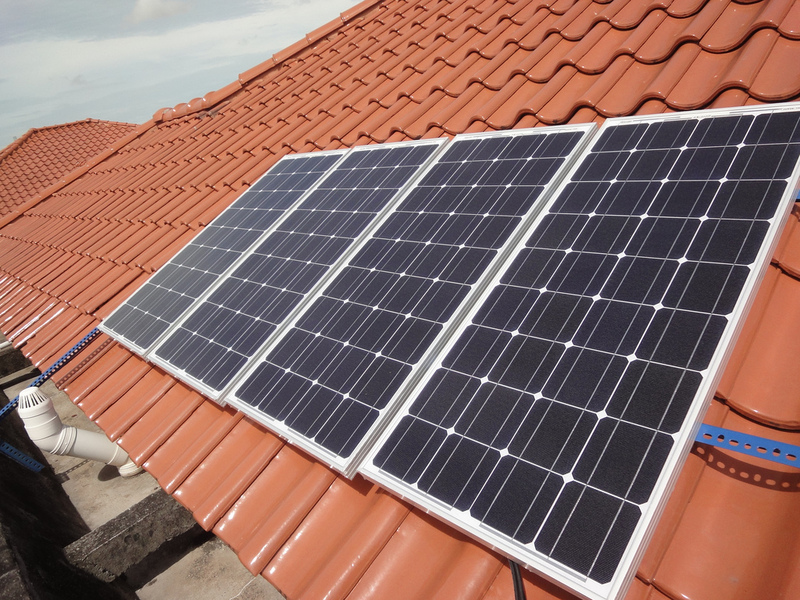 The third quarter of 2014 was the second largest quarter ever for solar panel installations in the U.S.; 1.35 gigawatts were installed in the quarter, up 41 percent over the same quarter in 2013. That brings the total amount of solar panels operating in the U.S. to 16.1 gigawatts (and 1.4 gigawatts from solar thermal power plants, which use mirrors to concentrate sunlight to produce heat and run turbines). The push getting solar onto rooftops and into the deserts of California, Arizona and Nevada isn’t just coming from the market. It’s also been pulled by incentives, both state and federal, as governments look to bring in carbon emissions-free power, which can provide electricity but won’t contribute to climate change. Some state incentives, like those in California, are starting to phase out by design as the solar industry becomes more competitive. But the U.S. federal incentive, the “investment tax credit,” called the ITC, which provides a 30 percent tax credit on operating clean power projects, is set to expire in 2017, and the solar industry is particularly worried about what the removal of that incentive would do for the industry. If the ITC isn’t renewed beyond 2016, industry-watchers predict that growth in the solar sector will be growth starting in 2017, though growth could ramp back up somewhere around 2020. Go out http://www.nrel.gov and run the PVWATTS app for best placement, you will fund the cost of solar is near parity to the utility companies,but only after the ITC is applied. I think they meant to say “flat” instead of the second “growth” in the above quote, Steve. However, prices are coming down so fast, and it seems that there is little doubt that this trend will soon vary, I believe the price reduction will be greater than the subsidy. At least, it will come close to the ITC subsidy. So, solar will take off faster and faster anyway. However, it is senseless to get rid of the ITC in 2017. We need to be promoting a quick conversion away from fossil fuels and nuclear energy, to solar, wind, efficiency and storage, the four-pack of the 21st Century. Add a little demand-side management to that and make it a five-pack. Katie, are you aware of the Obama admins war on coal and the predicted jump in the cost of electricity associated with it? Your article doesn’t mention this at all, yet it is likely the biggest contributing factor to the sudden increased investment in solar. Not to worry about the phasing out of subsidies (where the government forces other people to pay for you) it has been said that the best way to get people to do what you want is to give them no other choice. Todd, are you aware of the massive subsidies and tax breaks that have been given to the oil and gas industry for the better part of half a century? Taxpayers have been footing the bill for their projects long before solar was on the scene. Maybe you should take the blinders off and see that incentives for energy, renewable or otherwise, are par for the course in most industrial economies. I’m interested to see just how much energy ‘cracking’ will be able to generate in the next few years as well, sounds like an interesting new technology. :-) “Fracking”of course, mean while, creating Solar Panels is dirty (creates hazardous waste from the silicone process of mining and fabrication) and ends up with dirty waste to dispose of when they wear out. Nothing is perfect (or green) although a diversity of power generation makes sense. Yes, solar is inefficient and “dirty”, but panels can be upgraded. I read recently that (1) panels have been developed that are 47 percent efficient and (2) can be made for carbon (and other common elements. Other so-called GREEN energy producers cannot and we’ll be stuck with monster devices such as wind farms. Don’t even talk to me about forest burning biomass “modern” furnaces.I remember learning about the Internet in 1992 and look at all the change and miniaturization today. Keep the carbon in the ground and the carbon in the trees. Always remember, we are the good guys. Yeah Mr Bishop cheap generators in India and China while the Americans would continue to drive big SUVs which guzzle unlimited gas,….light up their buildings and christmas treee with lights….and then come up in a forum like this or anywhere in the world and talk about reducing carbon footprint for developing nations. How typical! Thank you for this. As an American, I get tired of reading comments like Mr. Bishop’s, but if I point out the hypocrisy, it’s explained away as ‘US hating, liberal non-sense.’ We need more international exchanges in comments.